James Graham is making a name as a great modern playwright by taking events from recent British history, adding his own personal take and creating entertaining dramas for the West End which play on our collective nostalgic recall. 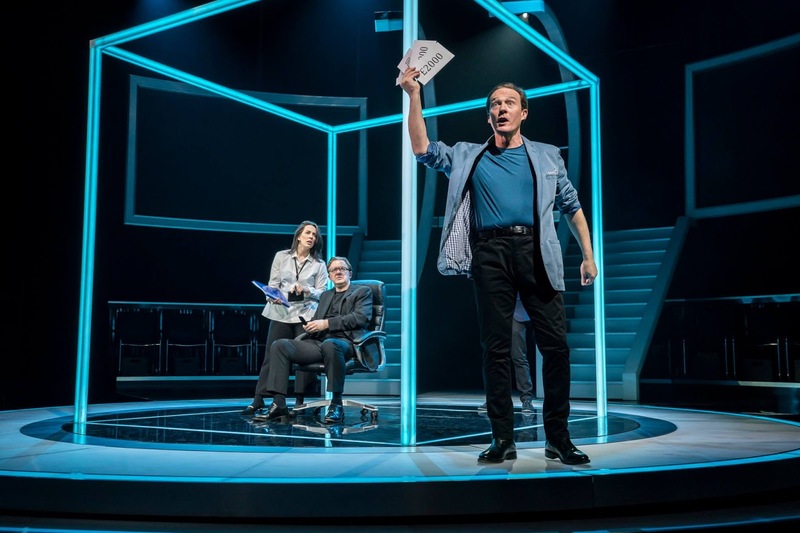 In this latest play, he takes us back to a time before Apple phones and Facebook when the main five terrestrial channels were chasing huge audiences and producers were coming up with formats that started the genre of "constructed reality". A form of TV that is based in reality but the audiences view is manipulated by careful casting and editing to generate a reaction. I have to declare an interest as I was working in TV at this time: watched Des O'Connor record "Take your pick" in our Studios, acquired the company that owned the format rights to "The Price is right" and came close to a deal to merge our company with Endemol, who created Big Brother. All three make cameo appearances in this show. Game shows were in popular decline and a reboot was needed which "Who wants to be a Millionaire" delivered. As a result the play has a special nostalgic resonance for me but is also brilliantly entertaining. 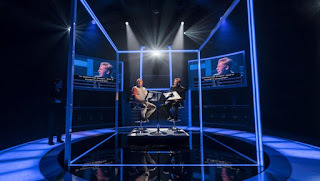 Graham takes the court case in which the prosecution sought to prove that the "coughing major" as he became known (although he did not himself cough) cheated in answering the 15 questions to win one million pounds in an episode of the show. 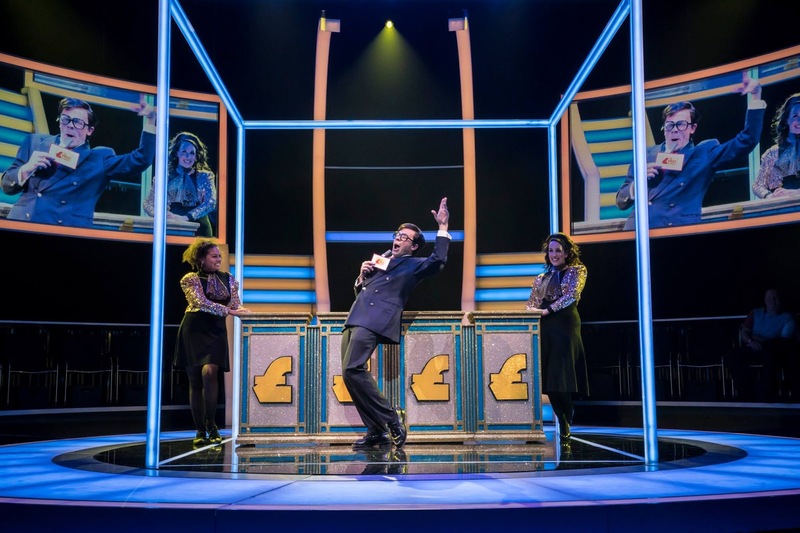 In the first half of the play he amusingly shows how the game show evolved, explored the public interest in quizzing, and presents the case against the Major. In the second half he plays with the audience and explores the way in which truth can be represented or manipulated to create dramatically different views. As with Labour of love, his last West End hit , he unpicks what we have seen in Act 1, as Act 2 plays out. In doing so he brilliantly suggests that the producer manipulated the edit to make the story and create fake news to drive the ratings at the expense of the innocent major. 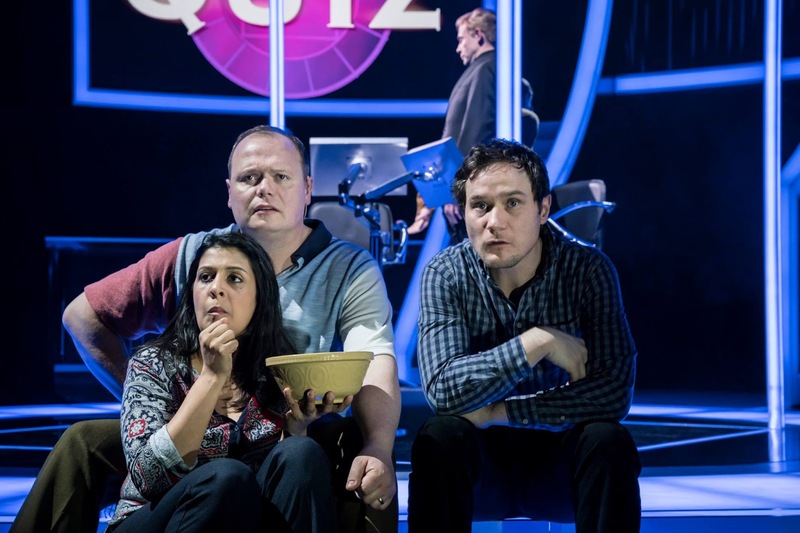 The audience are left to decide which version they believe. Gavin Spokes is wonderfully convincing as the Major who comes across dim but nice in the Quiz and leaves us wondering was it just an act to be entertaining on TV. HIs wife is played by Stephanie Street , an addicted quizzer , determined to try and win the show, if the Major was guilty she was the Commander in chief of the fraud. The third person in the dock was Tecwan Whitlock, a nervous man with a medical condition causing him to cough! 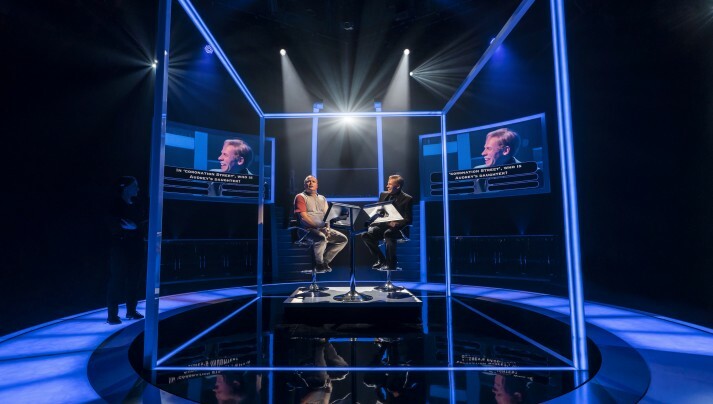 However the show is dominated by Keir Charles as Chris Tarrant (and several other TV quiz hosts) who presents hilarious caricatures of the TV stars In close up on the big screens above the stage. The smallest of twitches of the lower lip repeatedly brings laughs of recognition from the audience. 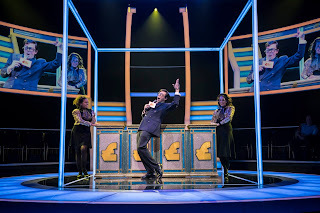 He also does a funny turn as the TV studio warm up man to open each Act , describing himself as the "the play fluffer". Greg Haiste is put in the dock by Graham as Paul Smith, the producer who made the allegations against the Major. The rest of the ensemble cast double up as other characters in the TV shows, the Ingram's personal life, the mysterious Quiz syndicate and the court case. slow the pace and is only loosely connected to the plot. The end result is knockabout entertainment around popular culture but with a serious warning about our trust of the country's institutions of Law and the Media to be fair and functional and the potential for built in bias in the way they operate. Whether you think the Major cheated or not, you are clearly shown how easy it is to manipulate public opinion by careful editing and presentation of the facts.